Months after a law outlining financial support for families with children came into force, parents’ associations, experts and opposition parties are demanding major changes. Jelena – not her real name – is nine months’ pregnant and is still second-guessing what she and her husband will call their baby girl. But the 26-year-old, who is employed and holds a MA degree from Belgrade’s Faculty of Forestry, has bigger problems at the moment than dilemmas over baby names. The new Law on Financial Support for Families with Children, changed how maternity leave allowances are calculated, so once Jelena gives birth, she will be able to draw a monthly allowance of around 3,600 dinars [around 30 euros], considerably less than what she would have received under the previous rules. Jelena says the sum is very far from sufficient. “When you divide 3,600 dinars by 30 days, I will have only around 120 dinars a day for me and my baby. Who will buy her diapers – my parents?” she asks angrily. The law, which aims to provide parents with financial support in order to increase the country’s low birth rate, has created a public storm, with some parents claiming it damages and discriminates against them. Those claiming to be the most discriminated against include self-employed women, female farmers, women earning more than three times the average salary, women that have worked less than 18 months continuously before going on maternity leave, families going through a divorce as well as families with children with disabilities. Due to this, many opponents of the law further argue it is worse than its predecessor. “I am not the only one here. A lot of women are in an even worse situation. We are being discriminated against,” Jelena told BIRN. “If I had known it was going to be like this, I wouldn’t have decided to have a baby,” she added. Before passing the law, government and state officials praised it as a tool that would help parents combine parenting with work and help couples expand their families. Some have warmly welcomed the new law. Parents’ associations have welcomed the allowances for each new born, ranging from one-time payment of 100,000 dinars [around 850 euros] for the first baby to around 2 million dinars for the fourth, which families would receive in installments. But Jelena says she would rather have her old salary back than be thankful for receiving 100,000 dinars. 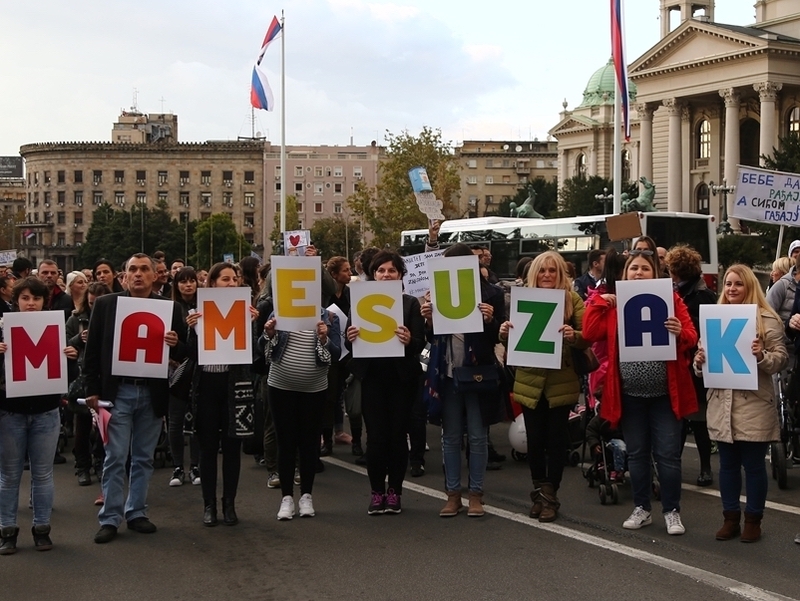 The allegedly discriminatory regulations prompted Jelena and several hundred other people to take to the streets on September 25, calling on the state’s authorities to act.